Baby Toolkit: Word on Sesame Street: Free eBooks! Word on Sesame Street: Free eBooks! Ranger and I spent part of the afternoon listening to lovable, furry old Grover read the audio eBook There is a Monster at the End of this Book. 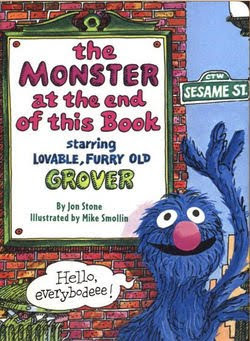 Each word is highlighted as Grover narrates. The audio effects cracked Ranger up. To celebrate its 40th birthday, Sesame Workshop issued its most popular title ever in ebook form [trivia: There is a Monster at the End of this Book hasn't been out of print since its original printing]. They plan of offering a new free ebook every week. Some of the ebooks will have audio and interactive capabilities. Early in 2010, Sesame Street and Impelsys (the technology provider) plan on offering even more titles for individual purchase and subscription. The eBooks can be viewed through a web browser, but do not seem to have a download option (please let me know if I'm overlooking something). Users can print pages from coloring and activity books like the seasonally appropriate Celebrate. Sesame Street ebooks can be found at http://ebooks.sesamestreet.org. For more information about the future of Sesame Street's eBooks, read Impelsys' recent press release. ***Baby Tookit is the independent opinion of a couple geek parents. We have no fiscal, social, or familial relationship with Sesame Street, Children's Television Workshop, PBS, or Impelsys. Heck, we're actually suspicious of newfangled characters like Elmo and Abby Cadabby and we feel like Big Bird doesn't get enough air time, but these eBooks are cool- especially while they're free. In addition, we are Amazon.com affiliates, so if you click through the picture above and buy the book (or other stuff), a small percentage of the sale will go to support Baby Toolkit (thanks!). We do own this book, and Ranger loves to hear it read by Jim even more than the ebook (sorry, Grover).